Washington, D.C., September 13, 2010 - Pakistani tribal areas where Osama bin Laden found refuge were momentarily open to the Pakistani Army when "the tribes were overawed by U.S. firepower" after 9/11, but quickly again became "no-go areas" where the Taliban could reorganize and plan their resurgence in Afghanistan, according to previously secret U.S. documents obtained through the Freedom of Information Act by the National Security Archive and posted today at www.nsarchive.org. 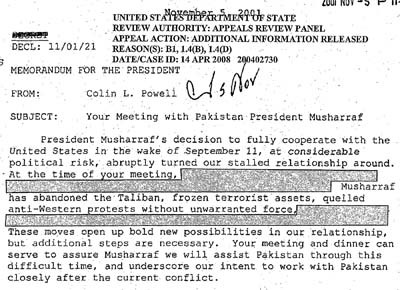 September 14 – November 16, 2001 – Pakistan asks the U.S. to clarify if its counterterrorism mission is against the Taliban or just al-Qaeda and repeatedly asks the U.S. not to let the Northern Alliance take over Kabul. Throughout the 1990s the Northern Alliance was supported by foreign states opposed to the Taliban, including India. September 17 – September 24, 2001 – Pakistani Intelligence (ISI) Chief Mahmoud flies to Afghanistan twice to meet Taliban leader Mullah Omar and discuss U.S. demands, al-Qaeda, and the future of Afghanistan. It is unclear if anything comes of these talks. President Musharraf replaces Mahmoud as ISI Chief in October 2001 and Pakistan and the U.S. move forward with military action against the Taliban and al-Qaeda. Both Pakistani and American officials have doubts whether Pakistan has enough control over the Federally Administered Tribal Areas [FATA] to combat Taliban and al-Qaeda-allied forces active in the region. A Pakistani military official calls certain sections of FATA “no-go areas” for the Pakistani Army. A protected source tells U.S. officials in Islamabad "the Taliban are "here to stay,"" and despite U.S. objections, Pakistan "will always support the Taliban." It cannot alter this position for fear of “rebellion across the Northwest Frontier Provinces, the Federally Administered Tribal Areas, and indeed on both sides of the Pashtun-dominated Pak-Afghan border.” In talks held in January 2000 between Pakistani President Pervez Musharraf and Taliban “President” Mullah Rabbani, “terrorism was brought up, but the talks were cordial and friendly, and that is what the Taliban remember. No one can dictate to the Taliban, [the source] declared; Musharraf understands this and would not seek to insist in changes that the Taliban cannot and will not deliver.” The informant also claims the “Taliban are growing, changing and moderating, and will continue to do so,” asserting they “have installed a strong system in Afghanistan” and “have support throughout the country.” The U.S. Embassy’s commentary on the validity of these claims are still classified and therefore withheld in this partially declassified version of the document. U.S. Department of State, Cable, "Deputy Secretary Armitage-Mamoud Phone Call – September 18, 2001," September 18, 2001, Confidential, 2 pp. Providing a comprehensive summary of political conditions on the ground in Waziristan, Department of State officials conclude that Pakistan “faces a daunting military and political challenge in trying to drive foreign fighters from North and South Waziristan and an even greater challenge in integrating these isolated areas into Pakistan.” According to U.S. officials, Pakistani authorities, “on the ground were clearly committed to this challenge and willing to use all resources provided to ensure that it occurs. They were making unprecedented efforts in a difficult and unyielding environment and using an approach that appears to be slowly yielding results.” Efforts to locate foreign fighters and to move towards integrating the restive tribal areas into Pakistani mainstream political society have proven to be extraordinarily difficult, however. The transference of power from maliks (tribal leaders) to mullahs (religious leaders) has not only opened up these regions to foreign extremists, but has also made it increasingly difficult for Islamabad to co-opt or cooperate with regional authorities.